Deborah Beauvais Welcomes Janine Sullivan who shares Melissa’s journey through the creation of children’s book Snowball’s Great Adventure. With a rare neurological disease called leukodystrophy, Melissa is an inspiration to all kids and adults. Hello, my name is Melissa Robillard. 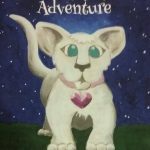 I am the author of Snowball’s Great Adventure, a children’s book about a white lion from Timbavati South Africa. Snowball was conceived while I was working with my speech therapist Kari Star. Kari is an exceptional therapist in Dartmouth, MA. I was diagnosed with a rare neurological disease called leukodystrophy when I was a young child. I have never let this neurological condition stop me from living life. While in speech therapy Kari and I were looking for new ways to stimulate my memory and language skills. We worked with the computer, talked about animals, and soon we had a story building. My personal care attendant Janine Cove Queen Sullivan was with me during these sessions. One day she exclaimed with great zest – if we are going to work so hard on this story we might as well publish the work as a children’s book. It was a fabulous idea and one I embraced whole heartedly. It is important to do new things to exercise the mind. It took one year from beginning to end. There is a lot involved in writing a book. Janine worked with me several times a week to pull a great story out of me. It was a stretch to define characters and create identities. I loved every minute of it. So many people came forward to help. My mom worked hard with technical matters. She has always been the wind beneath my wings and my greatest cheerleader. I am thrilled for many reasons. One, the work of this book brought many people together. That is what life is all about. We really do need one another. So many people helped this dream of mine come to life. You see, when I was in the second grade, I wanted to be an elementary grade teacher. That dream was not possible for me. One day in the early stages of writing the book, Janine said to me, “Melissa, what is the tool teachers use most?” I said books. Then she said, “what do many children use to learn?” I said books. Janine went on to say, “you are writing a book that children all over the world will enjoy. That makes you a teacher.” I smiled from ear to ear. Janine has a way of making dreams come true.